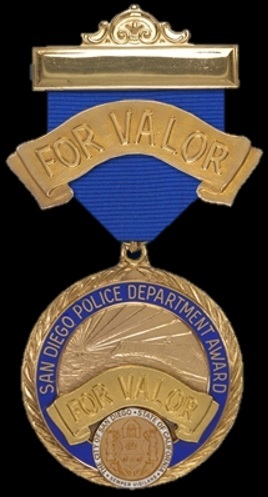 Years later, Mr. Brown was awarded San Diego Police Department's Medal of Valor for his actions. Mr. Brown, a resident of Del Cerro, died Thursday of heart failure at Grossmont Hospital. He was hospitalized June 17. He was 87. Mr. Brown became a cult hero in law enforcement circles for his decisive actions during the 1965 shootout. He took the initiative to enter the Hub Jewelry & Loan Co. at Fifth Avenue and F Street after police were unsuccessful in forcing the gunman from the building. When the gunman fled to a second floor, Mr. Brown followed. At the top of the stairs, Mr. Brown heard a clicking sound and turned to find the robber's gun misfiring. He shot the gunman twice from 6 feet away. The gunman, Robert Page Anderson, survived and was twice convicted of murder and sentenced to death. The first death penalty was set aside because jurors who opposed execution had been excluded. The second death sentence was overturned in 1972 when the state Supreme Court declared that the death penalty was cruel and unusual punishment. 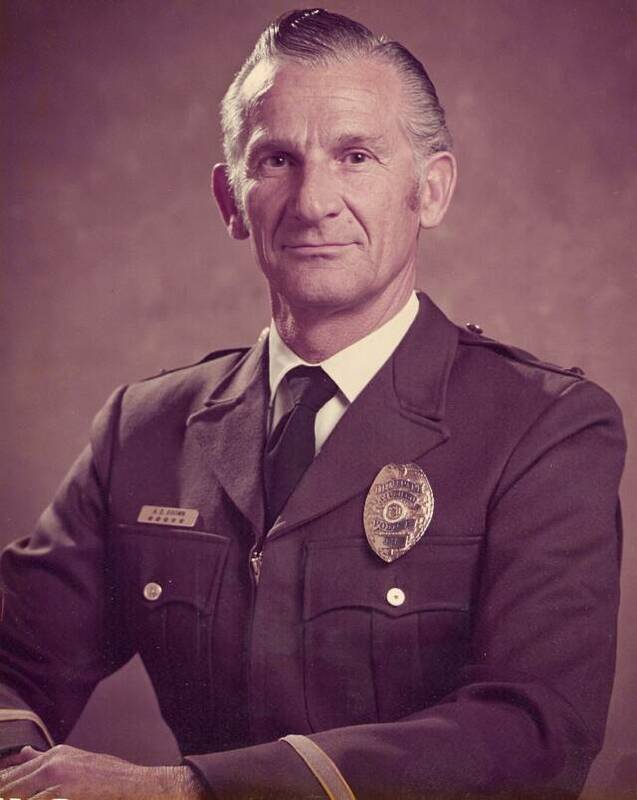 Mr. Brown became a police officer in 1948 and after several years on the force became concerned with the adequacy of the three-week training given new officers. He volunteered to take over the training. A young Bill Kolender, now San Diego County sheriff, received his training from Mr. Brown. “He was the best instructor, responsible and accountable,” Kolender said. “He just had a way of teaching young men and women how to care about their jobs, care about the people they dealt with and how to do their jobs professionally. After the 1965 shootout, Mr. Brown created the first S.W.A.T. team in San Diego, training police officers in the use of high-powered rifles and special weapons. Shortly after that and in response to the Watts riots in Los Angeles, Mr. Brown, then a lieutenant, teamed with Kolender and Lt. Bill Gore to create the Police Department's Community Relations Division to help the department forge better relationships with residents. Steve Willard, vice president of the San Diego Police Historical Society, said that before he joined the force in 1985 he had heard of Mr. Brown. Willard recalled stories of Mr. Brown going to a fried chicken restaurant in Pacific Beach at the end of the night to pick up unsold chicken that he would distribute to other police officers. Mr. Brown retired in 1974. He was born Jan. 3, 1920, in the Philippines, where his father, an Army colonel, was stationed. He moved to San Diego in 1943, where he went to work at Consolidated Vultee Aircraft Corp.'s plant near Lindbergh Field. Although he had an occupational deferment because of his defense-related job, Mr. Brown enlisted in the Army in 1944. 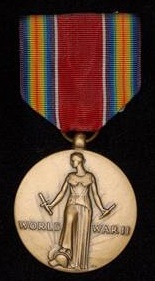 He became a paratrooper, reaching the rank of second lieutenant. He saw action in Okinawa and was part of the Japan occupation forces. In the mid-1970s, Mr. Brown started an annual December luncheon for former San Diego police officers. The event grew from a couple of dozen officers to more than 300 now and is organized by the San Diego Police Historical Association. Mr. Brown is survived by his wife, Vera; sons, Frank Brown of San Diego and Fred Brown of Tonasket, Wash.; 10 grandchildren; and eight great-grandchildren. His remains will be cremated. A memorial service is planned for 3 p.m. July 12 at the Scottish Rite Center in Mission Valley. The family suggests donations to the San Diego Scottish Rite Childhood Language Center, 1895 Camino del Rio South, San Diego, CA 92108 or the San Diego Police Historical Association, 1401 Broadway, MS-734, San Diego, CA 92101. San Diego police Sgt. Allen D. Brown reported to work on April 8, 1965, expecting a quiet day reviewing arrest reports. Instead, he was hailed as a hero for his role in a downtown San Diego gunfight that at the time was called one of the largest involving police in U.S. history. Mr. Brown critically wounded a gunman with two blasts from his shotgun during a face-to-face confrontation. The gunman had killed a pawn shop manager in a robbery attempt, leading to a four-hour shootout with 65 officers during which an estimated 800 gunshots were fired. “I wouldn't ask anybody to do what I did at the pawn shop, but it seemed like it was just something that had to be done at the time,” Mr. Brown said in a 1972 interview with The Evening Tribune. Information on this site is provided free of charge and done as a courtesy. Additional information may be available if research is conducted. Research is done at a cost of $25 per hour with no assurances of the outcome. For additional information please contact us.